One of drone pilots’ tasks is to identify and take out insurgents. 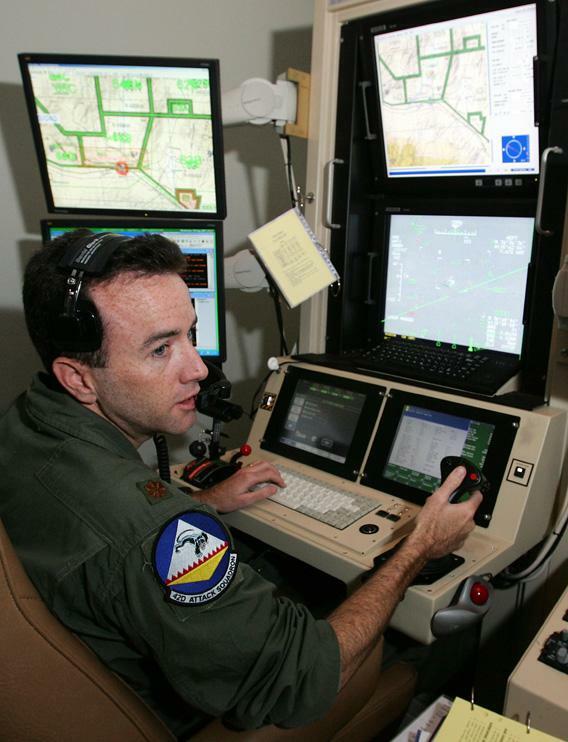 The escalating dependence on drone pilots, as Maj. Dave Blair agonized in the May-June issue of Air & Space Power Journal, is undercutting the ability to award combat medals. “On the current trajectory,” Blair wrote, “the only Air Medals will be the ones in history books.” In 2009, after all, the Air Force was already training more drone pilots than bomber and fighter pilots combined. Blair’s proposal to give drone pilots combat medals—despite the fact that the pilots sit safely thousands of miles away from the battlefield—is revealing. Technology is radically altering warfare, and it seems inevitable that military medals will need to evolve, too. But evolution here is not a bad thing, as so many have lately suggested. The nature of how the U.S. military recognizes bravery on the battlefield has been changing for more than a half-century. During World War II, for instance, 464 Medals of Honor were awarded. During the Korean War, that number was at 133, and during Vietnam, 246 service members received the honor. Since 9/11, strikingly, only 10 Medals of Honor have been awarded. Part of the decline is explained by the creation of other awards for valor, and part is due to an increasingly rigorous review process. Yet one major cause, a Defense Department spokeswoman told the New York Times in 2010, is the changing nature of warfare. Insurgents’ improvised explosive devices, suicide bombers, and mortar and rocket attacks don’t allow for the same degree of face-to-face combat canonized in the Homeric and other classic warrior epics. Advances in U.S. military technology certainly have the same effect. According to a 2009 Army Times report, there have also been declines in awards of the Distinguished Service Cross, Navy Cross, and Air Force Cross. That’s the context for understanding the controversy over the report that the Pentagon is considering creating Distinguished Warfare Medals for drone pilots. Six potential designs have apparently already been created by the Army Institute of Heraldry. The medals would rank between the Soldier’s Medal, awarded for “heroism not involving actual conflict with an enemy,” and a Distinguished Flying Cross, which honors “heroism or extraordinary achievement while participating in an aerial flight.” At Salon, Glenn Greenwald fumed that the “effort to depict drone warfare as some sort of courageous and noble act is intensifying.” The BBC’s Jeremy Clarkson wondered in the Sun whether the new drone-pilot medals should feature an armchair and a Coke machine or two crossed burgers. The objections to medals honoring drone pilots stem primarily from the widely held belief that it is somehow cowardly to use remotely operated vehicles in war. This hyperventilating about heroism being killed by machines misses the point. For one, the list of weapons once considered “cowardly”—to which armed drones have now been added—include not only the submarines of World War I but also the bow and arrow and the gun. (Remember that scene from Indiana Jones?) The point of each of these technologies was the same: to gain an asymmetrical advantage against adversaries and reduce risk. They certainly didn’t. The entire crew, save the captain, couldn’t even see the enemy during the fighting. William Keeler, the ship’s paymaster, had worried there wasn’t “danger enough to give us glory.” Romantics of the era were especially upset, as David A. Mindell describes in Iron Coffin: War, Technology, and Experience Aboard the USS Monitor. Nathaniel Hawthorne wrote in the Atlantic that “heroism—so deadly a gripe is Science paying on our noble possibilities—will become a quality of very minor importance, when its possessor cannot break through the iron crust of his own armament and give the world a glimpse of it.” Herman Melville complained that “Warriors/ Are now but Operatives; War’s made/ Less Grand than Peace.” Operatives was a term for factory workers. In other words, asymmetrical warfare has always provoked Greenwald-style accusations of cowardice. The point of armed conflict isn‘t to increase risk for the sake of “heroism.” It’s to put fewer of one’s own combatants’ lives at risk. There’s no reason, moreover, that drone pilots can’t be just as worthy of combat awards as fighter pilots. Consider a scenario offered by Blair: A pilot fires a series of laser-guided bombs at insurgents attacking a team of Navy SEALs, taking out the insurgents’ .50-caliber machine gun and stopping them from flanking the SEAL team. Are the pilot’s actions really more honorable for flying an F-15 fighter—itself beyond the reach of insurgents’ weapons—as opposed to a remotely piloted aircraft? Today’s drone pilots aren’t mere factory “operatives.” Working in pairs in front of an array of monitors, one pilot is responsible for the plane while a “sensor operator” is responsible for tracking and laser “designating” live targets and providing optimal video for intelligence officers and commanders monitoring the feed. Drone pilots scan convoy routes for IEDs, provide support for combat missions, and identify and take out insurgents. If we mark military prowess merely by personal physical exposure, then yes, a blurry line has been crossed as Air Force pilots move from, as Blair put it, “ten thousand feet” to “ten thousand miles.” That makes it more difficult to justify awarding traditional combat medals to drone pilots. But that is where the proposed drone-pilot medals come in: They will help retain the meaning of existing medals, award those who perform their duties exceptionally, and, perhaps most importantly, could also help address, rather than exacerbate, a popular concern: that drones diminish accountability. Don’t we want drone pilots to be aware of their great responsibilities and to be rewarded for exercising them honorably? The proposed Distinguished Warfare Medal makes sense because it recognizes that drone pilots are engaged in deadly serious warfare. In a context where sparing civilian lives should be of the utmost importance, formalities that set apart flying a drone from playing a video game should be welcomed, not castigated. (As the New York Times’ Elisabeth Bumiller reported this week, in some ways drone warfare is actually more intimate than flying fighter planes.) The flight suits drone pilots wear presumably serve the same ends.